The exhibition has introduced over 300 cinema works and nearly 60 films of documentary to the visitors. All works were awarded and previously entered into the final rounds of several prestigious festivals held by the Ministry of Information and Communications from 2010 to 2015. It is one of some activities in Action Program of the Government about propagandizing and introducing ASEAN community; forma tion of ASEAN community and some benefits from the community. The works reflects such topics as, the beauty of the country and people of ASEAN nations, traditional culture in ASEAN countries, environmental protection, climate change, people in the ASEAN community and quality of the arts in ASEAN. Particularly, the exhibition still features some general stamps and signals from some ASEAN countries. Through the exhibition, we can understand more about culture, people and living environment of some nations in ASEAN regions. The event is expected to offer visitors an opportunity to understand more about the culture, people and environment of ASEAN member countries and tighten cultural solidarity in the ASEAN community. The exhibition is as an attempt to tighten the co-operational relations among Vietnam and other countries in the ASEAN Community, remain the relationship of ASEAN countries as well as achieved results after 49 years of unceasing co-operation of all member countries. 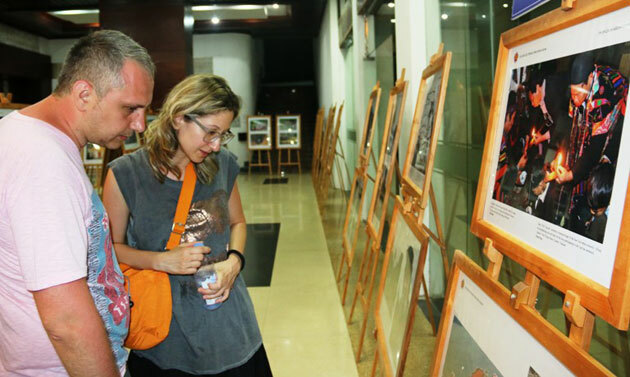 Closing the event, all displayed photographs and documentary films will be sent to Thua Thien-Hue provincial People’s Committee for the purpose of publicity and introduction to the world.